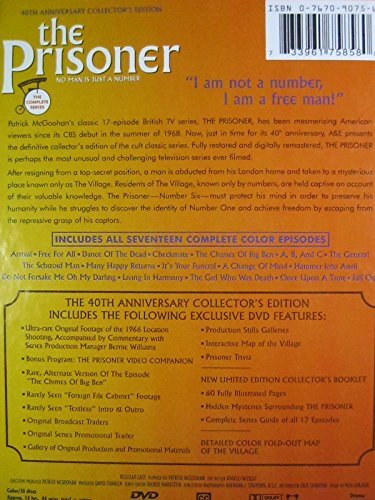 THE PRISONER, THE COMPLETE SERIES BOX SET, 40TH ANNIVERSARY SPECIAL EDITION STARS PATRICK MCGOOHAN IN THIS CLASSIC 60'S TV SERIES. ALL EPISODES ARE DIGITALLY REMASTERED AND COMES WITH A TON OF BONUS EXTRAS, INCLUDING A 60 PAGE ILLUSTRATED BOOK AND A FOLD OUT MAP OF THE VILLAGE, ALL AVAILABLE EXCLUSIVE AND ONLY WITH THIS DVD SET. THIS MAKES THIS COLLECTION A MUST HAVE FOR ANY DVD COLLECTOR AND FAN.